The Ontario Literacy and Basic Skills (LBS) program helps adults in Ontario to develop and apply communication, numeracy, interpersonal and digital skills to achieve their goals. The LBS program serves learners who have goals to successfully transition to employment, postsecondary, apprenticeship, secondary school, and increased independence. The program includes learners who may have a range of barriers to learning. The LBS Program is available to Ontario residents who are out of school and communicate in English or French. Special emphasis is placed on serving individuals who are receiving social assistance through Ontario Works. Services are free, and are offered on-site at approximately 340 locations across the province, in directed and self-directed format, and online through e-Channel service delivery. 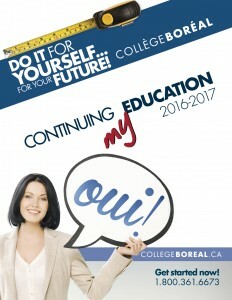 At College Boreal, we deliver this program in French at our twelve different addresses. who are proficient enough in speaking and listening to benefit fully from the language of LBS instruction (English or French). This eligibility requirement does not apply to Deaf learners.